If confirmed by the Senate, Chris Scolese would be taking over the NRO amid a push by the administration to stand up a new military branch for space and develop closer ties between the Defense Department and the NRO. Currently the director of the Goddard Space Flight Center — NASA’s largest — Scolese would come into the NRO with an outsider perspective. Since the secret spy satellite agency was created in 1961, most of its leaders have been former military officers or career civilians who come from the Defense Department or the Central Intelligence Agency. 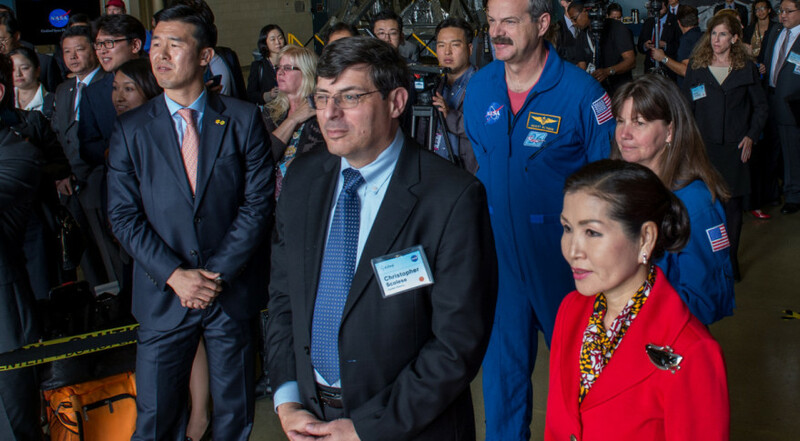 Scolese was recognized last year by the American Institute of Aeronautics and Astronautics for having “a rare blend of technical achievements and managerial skills.” Loverro said Scolese’s expertise running large government bureaucracies and steering complex space programs make him a good choice to run the NRO. The nominee has strong support from the Pentagon’s top leadership, notably from Undersecretary of Defense for Research and Engineering Mike Griffin, a former administrator of NASA. After Griffin stepped down, Scolese in 2009 served as acting NASA administrator until the new administrator Charles Bolden was sworn in. NRO’s current director Betty Sapp has been in charge of the agency since 2012. Scolese would be the first director to be nominated as a political appointee. Previously directors were appointed by the secretary of defense with the concurrence of the director of national intelligence. Congress changed that in the Intelligence Authorization Act for Fiscal Year 2014. The law amended the National Security Act of 1947 to require the president to appoint the NRO director with the advice and consent of the Senate. Sapp was grandfathered. Scolese would serve as a Trump appointee so the next administration could choose to let him stay or replace him. Before the White House decided to nominate Scolese, another candidate said to have been on the short list to run the NRO was Troy Meink, the director of the NRO’s geospatial intelligence directorate, who previously served as deputy undersecretary of the Air Force for space. One of 17 intelligence community agencies with a workforce of about 3,000 people, the NRO is headquartered in Chantilly, Virginia. It develops and operates overhead reconnaissance satellites and conducts intelligence-related activities. It operates ground stations at Buckley Air Force Base, Colorado; Fort Belvoir, Virginia; White Sands Missile Range, New Mexico; and has a presence at the Joint Defense Facility Pine Gap, Australia, and the Royal Air Force Base Menwith Hill Station, United Kingdom. NRO launches satellites from Cape Canaveral, Florida, and Vandenberg Air Force Base, California. After Trump in June directed the Pentagon to form a new military branch for space, one issue that stirred a heated debate was whether the Space Force should be combined with the NRO. An outright merger was taken off the table, but several proposals have called for closer ties between DoD and the NRO on national security space matters. The Air Force took this further. In a September memo, it recommended naming the next director of the NRO also the director of the Air Force Space Rapid Capabilities Office in order to establish “unity of command” and reduce duplication in space programs.